The Bocce Ball game is a great way to enjoy the outdoors while having some exciting competitive fun. One of the oldest forms of lawn bowling, Bocce Ball is a fun easy game to play for all ages. This set includes 8 bocce balls, 4 for each team, and one white Pallino. 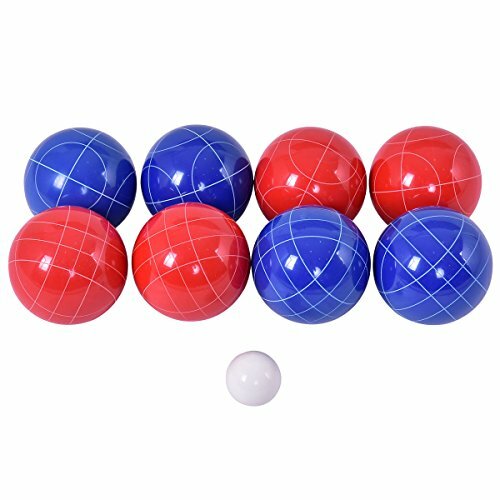 Set includes all pieces necessary to play: 4 red and 4 blue 90mm balls and 1 white 40mm jack. Ideal for a grassy backyard, outdoor park, or sandy beach, the bocce ball set can be played almost anywhere. Grass, sand, dirt and other natural ground surfaces make interesting playing fields, and switching up the terrain helps keep everyone on their toes.